Team17 have today announced their partnership with garages based independent developer Dlala Studios on the 2D multiplayer arena based brawler Overruled! which together they will be releasing later this year across multiple platforms. “It’s absolutely mind blowing for us to be able to announce a partnership with Team17. We’ve known some of the guys for a couple of years and have been playing their games for a couple of decades. They are the perfect partner for Overruled! They understand same room multiplayer better than most and they have a real desire to help us succeed as a studio. To be honest we’re incredibly honoured and overwhelmed to be working with them and can’t wait for the future!” said Aj Grand-Scrutton CEO and Craig Thomas CCO at Dlala Studios. Choose from a diverse cast of characters and challenge friends to a battle with both local and online multiplayer! All you have to do to win is score the most points by the end of the game. But the rules are yours to play with and with over 20 dynamic change ‘em up cards, you’ll never know how the battle will go! Don’t incite the enemy as they are the master of your fate! You could be playing Deathmatch now, but one of your rivals might decide to change it to Swag Bag. Or King of the Hill. Or Capture the Flag. Everyone dead? Double the respawn timer! Not doing so well by yourself? Turn on teams! Got the swag bag? Double the points you earn! 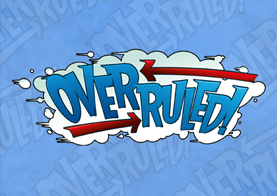 Overruled! is scheduled for a 2014 release on PC and additional platforms TBA.